Paco Rabanne Lady Million Perfume // There's been a tiny amount of this sitting in the bottle for a month or two as I couldn't bring myself to finish it but I finally did. I love this scent and it's the perfume I get the most compliments and questions about when I wear it. This is my second bottle and no doubt I'll buy another bottle soon. Alison Claire Mango Body Butter // I'm not normally a huge fan of body butters as I find them too thick but I completely fell in love with this one. Although it's a body butter and is still quite thick, it sunk into the skin easily and very quickly. I also really loved the mango scent and the packaging is really nice. I will be buying the full size of this once I've finished the other body moisturisers I have. Philip Kingsley Daily Damage Defence Conditioning Spray // I bought this mini bottle completely on a whim while ordering other Philip Kingsley products without reading any reviews on it. I'm pleased to say, I really loved it. I sprayed it all over towel dried hair to condition as well as detangle. I have a couple other leave in conditioners to use first but this is on my repurchase list. La Roche-Posay Effaclar Duo // I loved this when I bought it and completely raved about it since it really helped to clear my skin. Recently though it's been causing really bad breakouts so I stopped using it. I'm pretty sure it's the fragrance in it that my skin doesn't like as I've reacted to other products in the Effaclar range which is a shame. There's a tiny amount left but I know I'm not going to use it again so there's no point keeping it. L'Occitane Pivoine Delicate Hand Cream // Peonies are one of my favourite flowers and I really loved this hand cream. It was quite a light hand cream so great for during the day. 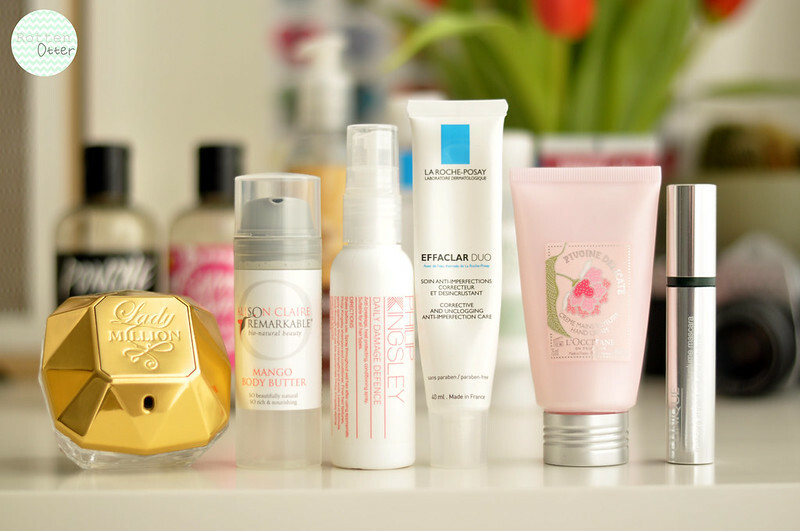 I have a million other hand creams to use so don't need to repurchase just yet. Clinique High Impact Extreme Volume Mascara // I'm a huge fan of the original High Impact Mascara so was really excited to try the Extreme Volume version. I really loved how it made my lashes look and I would definitely buy it again but it dried up pretty quickly. Lush Ponche Shower Gel // This is a Christmas limited edition I bought in the sales in 2012. I tucked it away in my room and completely forgot about it till the other month when I started using it again. It smells of oranges and tequila and one that I use in the morning. It isn't available anymore but will definitely buy another bottle if it comes out again this Christmas. Lush Snow Fairy Shower Gel // This is another one that I completely forgot I had. I also bought enough bottles the other year I didn't need to buy any this Christmas! I love using this shower gel for bubble bath as the scent is so strong it fills the whole house and creates a lot of bubbles. I tend to use this at night as the scent lingers on your skin for a long time. I still have another bottle to use so don't need to worry about it till next Christmas. The Body Shop Almond Conditioning Hand Wash // I was quite disappointed with this hand soap. It is very moisturising and nice to use but it never felt like it was washing my hands especially if they were greasy or dirty from cooking. I bought this using a 40% off voucher so never paid full price which I'm pleased about and I wouldn't buy it again. La Roche-Posay Micellar Solution // I really enjoyed using this micellar solution from La Roche-Posay and it didn't irritate my skin like other LRP products have. It still doesn't beat bioderma and I don't think I'd buy another bottle. Mario Badescu Cream Soap // I had about a quarter of this cleanser left but after the hole Mario Badescu Control Cream having unlisted steroids in it I didn't really want to finish it off. Mario Badescu not listing every ingredient in products has really made me think about buying their products in the future. I still have two masks from the brand which I'm still not sure if I'll use or not. balance Me Rose Shower Gel // I love the scent of this shower gel as it's a fresh rose scent and not a horrible old lady rose. It's also great for sensitive skin and doesn't irritate my eczema. I do find myself going through it quite quickly though which is it's only downside. Can you tell me more about the Badescu story? I almost bought a couple of products the other day. 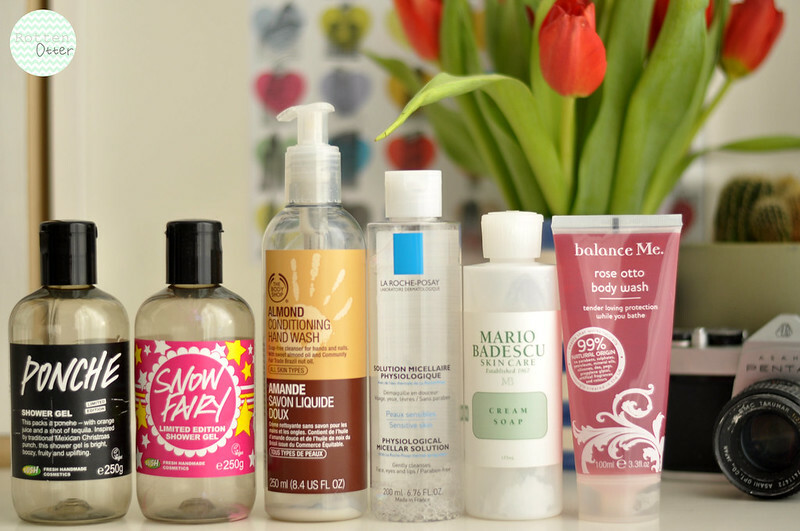 I really enjoy reading 'empties' posts, it shows that you really know about these products and haven't just used them once or twice. I have tried a few testers of the Effaclar Duo, and like you I really loved the effect it had on my skin at first but now I feel like it isn't making much difference to my skin. I much prefer to use the LUSH Grease Lightning. I have tried La Roche-Posay Effaclar Duo too and I so love it. No wonder why you love most of these products for they seem to be great products to try out. Among these products that you have shown, I wanna try the Clinique High Impact Extreme Volume Mascara. I am on hunt for the best mascara and I wanna know if this is the one for me.